Revising vocabulary can be tedious for students (and teachers). A fun and probably more memorable way of doing it is through crossword puzzles which you will have to devise yourself of course. There is a number of pages that can help you to design your own crosswords. One of the easiest and most helpful can be found in Discovery Education where you can also choose from a number of other word puzzles to make, such as Word Search, Letter Tiles and more. You just add the words with their definitions in the box provided and your crossword is ready with the click of a button. 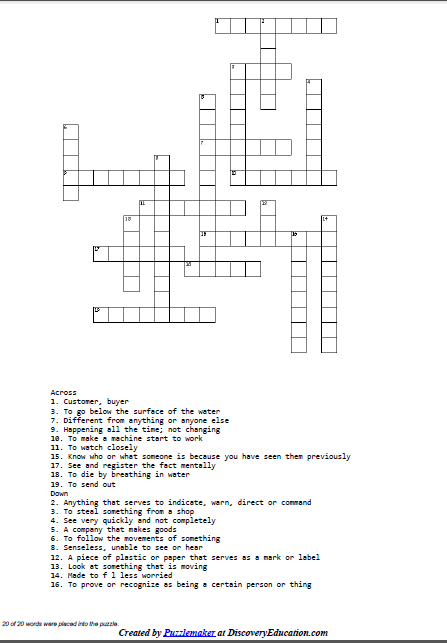 Below you can find the crossword I prepared for our revision of Unit 6, QSE Intermediate, Andrew Betsis Editions. Words and definitions were copied from the book's glossary.